1. In a jug, stir the gin and ginger together, then cover and chill for up to 24 hours until ready to serve. 2. Strain the gin into 2 tall glasses and add a scoop of ice cubes to each. Top up with the sparkling rhubarb and serve. 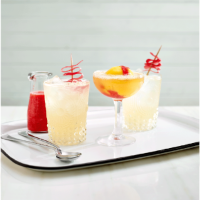 Make a garnish to decorate the glasses by threading ribbons of rhubarb peel onto cocktail sticks.